Could you please avoid this page with the red icon and test with other pages if it runs here with many tabs? As I entered in edits, it seems to depend on page. This site (slobodni.net) is very important for me. But, I just tested situation with facebook. Facebook is important for other people also, so it seems that the "heavier" page is, sooner you can see problems if you open a lot of tabs. I also noticed problems with facebook, but facebook needs a bit more tabs. Also, I open new tabs by using shift+click, which opens tabs in same memory space, which probably leads to problems. 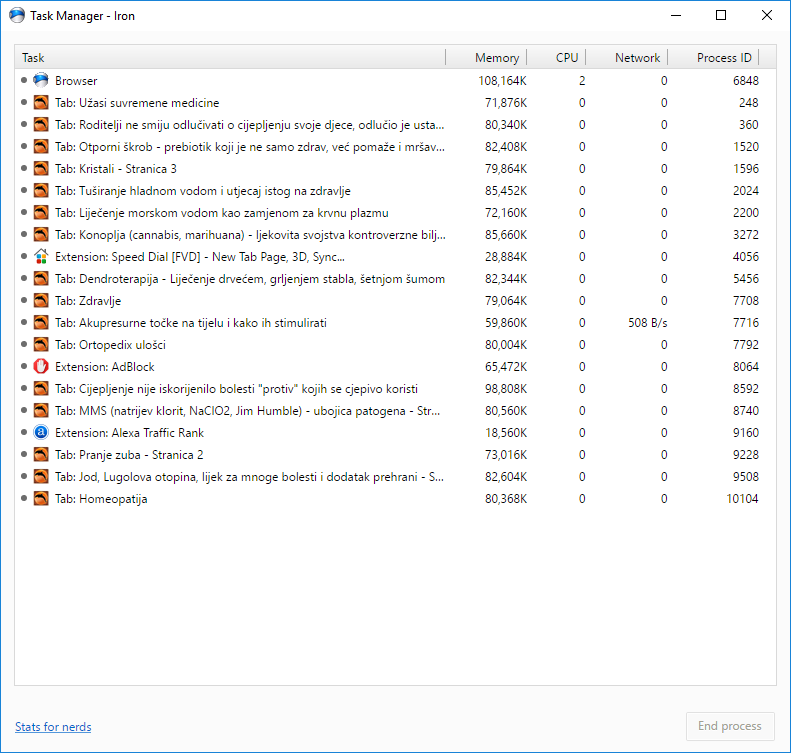 Try to find heavier page (facebook is fine for that, but you can use slobodni.net as heavy page) and open tabs in same memory space by using shift+click. And see what is causing problem, as older version works fine. I'll return to older version for the moment, as I can't avoid slobodni.net, it is important site to me. As you can see, each tab is in its own process, even when I opened tabs with shift+click on a link (my standard way of doing it). Also, you can see that memory requirement for slobodni.net is much, much smaller (about 3x). Well, this means there are many engine changes in newest version. Not sure if you would be able to sort this out, but looking at this info, sooner or later some people will also start to have problems. If you can at list start each tab in its own process? It doesn't look just like a problem with one site, it is something deeper. It definitely is more pronounced on this particular site, but check this two versions, they are really different how they process tabs. New way is much less optimized, especially on slower computers. Just noticed, I wrote that I open tabs with shift+click. It is actually CTRL+click on link. Sorry. SHIFT+click opens new window, CTRL+click opens new tab. Alan_SP wrote: Also, I open new tabs by using shift+click, which opens tabs in same memory space, which probably leads to problems. This is much more complicated, isn't it. Especially when you need to do this more than once, as I open many tabs. And it worked that way before, with older version. It looks like bad practice, opening all tabs in same memory space, anyway. If there's a problem with one tab, all tabs will crash as they are same process. Strange that this is how newer version does things. Cannot pin running IronPortable to taskbar. Download SRWare 55, 64bit to desktop and extract. I found that it does work if I pin the Iron.exe under the /Iron folder. And why does IronPortable.exe and Iron.exe and chrome.exe all have slightly different icons? Looks extremely amateur. Please help. Milouze wrote: I have submitted the file in question and it should no longer be flagged. Guys, if you finally won't do anything about it, it seems I have to move to another browser. Constant black screens in some versions of Iron with hardware acceleration on. In some version everything works fine (e.g. 51 - 64 bit, 41 - 32 bit), in some there are constant black screens (e.g. 49-32 bit, 55 - 64 bit). OS: win 7, 64 bit. It starts to be really annoying when I download a new version of Iron and get another portion of those black screens.